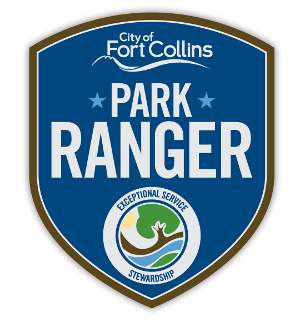 In 2013 the City of Fort Collins Parks Department launched the Park Ranger program. Currently two park rangers monitor and protect 875 acres of developed park land including 6 community parks and 49 neighborhood and pocket parks. The Park Rangers also cover 34 miles of recreational trails that connect our community. Park Rangers focus on safety, service and stewardship of our parks and paved trail system. Rangers provide education and information on park policies and laws. These policies and laws were created to provide a safe, clean and enjoyable experience for all park visitors and trail users. Did you know that you can receive a ticket and a fine of up to $100 for not disposing your pet's waste? Help keep our trails and parks clean, pick up your pet's waste. 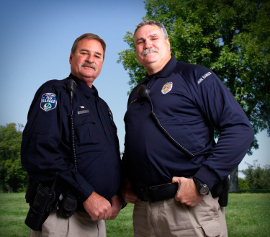 Bud Bredehoft and Mike West possess over 65 years combined service in law enforcement. They served together for twenty five years with the City of Fort Collins Police Department prior to joining the Parks Division as inaugural Park Rangers. Ranger Bud Bredehoft started his new career with the Parks Division in March 2013. Bud transferred from the Fort Collins Police Department where he retired after 25 years of service. He served the community in many various positions with the department. His principle experience was serving in a Problem Policing and Community Oriented Policing capacity within the department. He is excited to be a part of something new as a Park Ranger and finds the position offers many opportunities to mix with people that are enjoying the many amenities that Fort Collins recreational areas offer. Ranger Mike West joined Bud Bredehoft as the City's second Park Ranger January 2014. Mike has 25 years of experience in law enforcement. He was a Sergeant with the Fort Collins Police Department prior to joining the Parks Department.Mike's favorite aspect of being a Park Ranger is the ability to continue to serve the public in a new capacity while building new relationships with Citizens to jointly solve Community/Park issues. Mike looks forward to building the City Parks Department Ranger Program. He also enjoys being outside and a being part of protecting our natural resources and keeping them safe.